Lineco Oversized Archival 3-Ring Album Box with Clamshell Style Lid, 12.25 x 11.25 x 2'', Tan by Lineco at Marco Marcucci. MPN: 7991112. Hurry! Limited time offer. Offer valid only while supplies last. Store important papers and photos inside this economical and durable acid-free box binder. Reinforced metal edges. Tan BoXBinders have a 'O' Ring. Store important papers and photos inside this economical and durable acid-free box binder. Reinforced metal edges. Tan BoXBinders have a 'O' Ring. Clamshell lid and 1.5" three-ring internal binder keeps contents safe and secure. 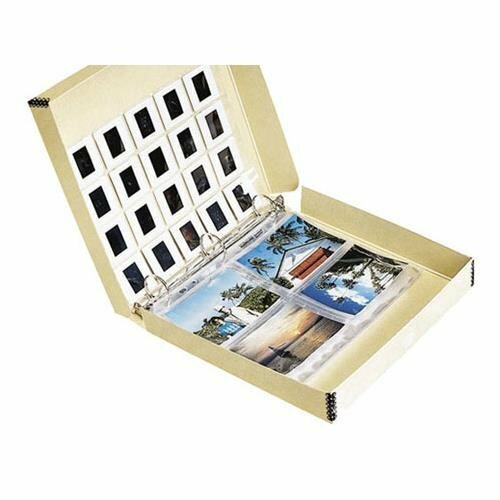 Enjoy all the safety and security an archival quality box provides, along with the presentation qualities an album offers. A 1.5" plated steel O-Ring mechanism secures whichever standard size pages you choose to include. Protect photographs, negatives, slides or documents. A Velcro lock tab secures binder covers together for additional security during storage or transport. The tan boxboard offers acid-free and lignin-free protection form the elements, and is buffered with a 3% calcium carbonate buffer for added protection. Print File Flip-top CD Storage Box, Holds Approximately 50 Sleeved CDs, Archival. Adorama 8.5x11" Print Storage Box, Drop Front Design, 8x11 11 1/2x1 1/2"
Lineco Drop-Front Storage Boxes black 9 in. x 12 in. x 1 1/2 in. Print File Shoe Box Archival Print Storage Box, Holds Approximately 1000 4x6" Prints, Black Exterior.